US equities closed moderately mixed, sp -2pts at 2429 (intra low 2419). The two leaders - Trans/R2K, settled +0.6% and -0.2% respectively. 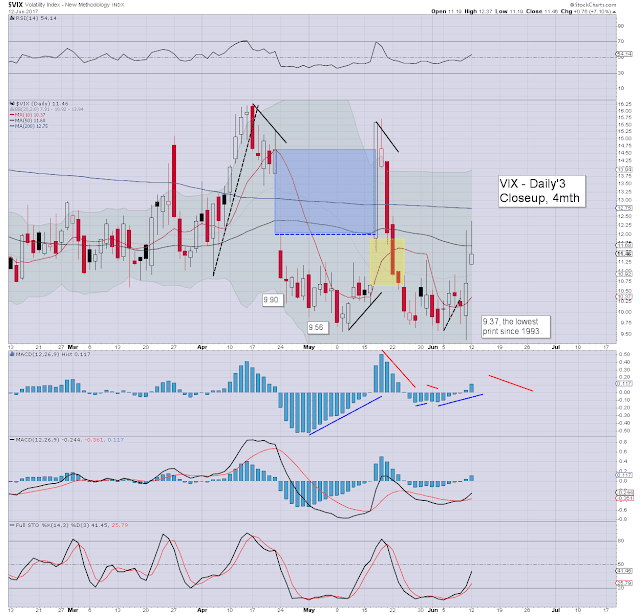 VIX settled +7.1% at 11.46. 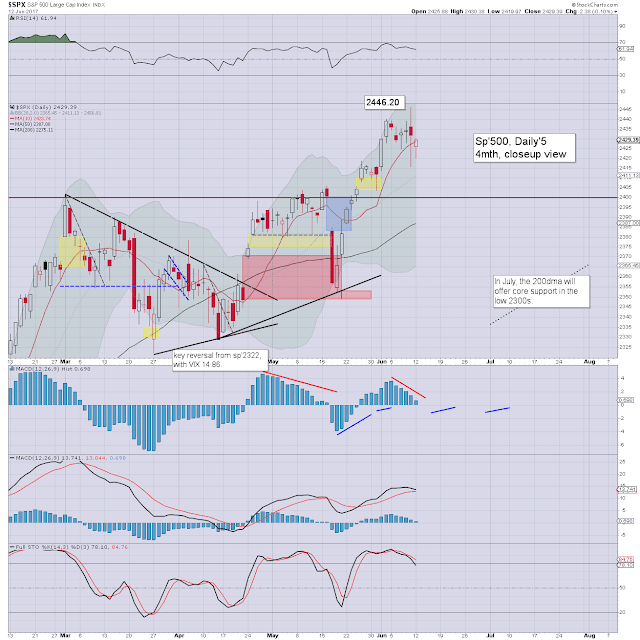 Near term outlook offers a washout in the sp'2390s, before the broader trend resumes. 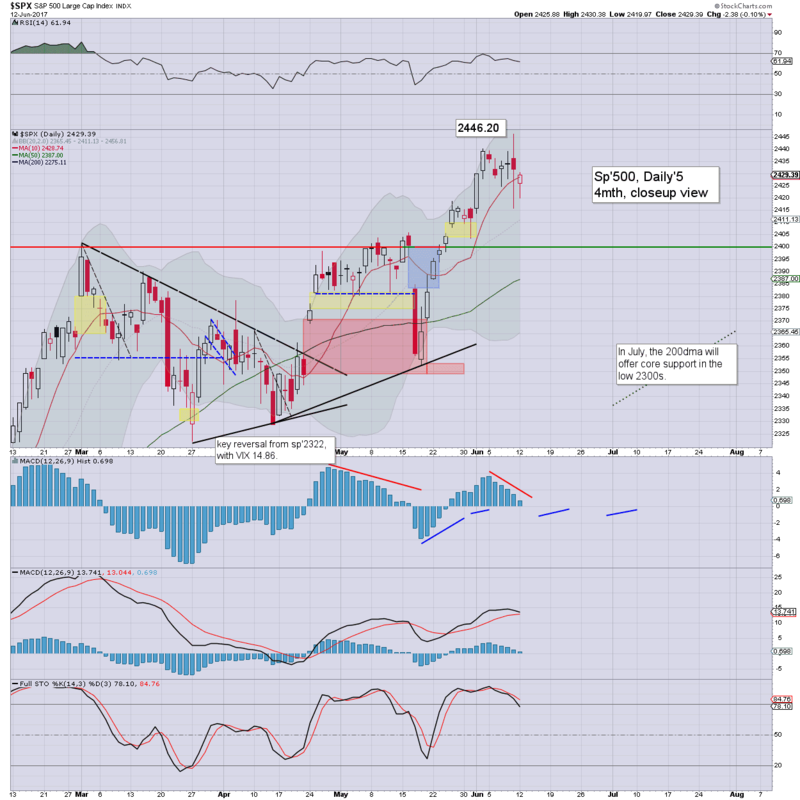 The 2500s remain a realistic target as early as late July. It was a broadly weak day, and that is likely how it will remain until the Fed raise rates this Wednesday afternoon, along with an hour of chatter from the Yellen. Clearly, tech is under some distinct pressure in the near term, but lets keep things in perspective, shall we? The Nasdaq comp' is in the 6000s, that is a clear 20% above core support of the giant psy' level of 5K, which we might simply never trade under again. Its also somewhat amusing how many have forgotten that whilst last Friday saw a rather strong reversal, we had no less than FIVE indexes break new historic highs. Near term: another wave lower to the sp'2410/00 zone, with a viable brief washout in the 2390s, before whipsawing back upward. Considering price action in tech, and the fact that we saw VIX 12s today, the 13/14s are now on the menu. A touch of colourful cirrus. Bullish?